Yr Hen 'Sgubor Climbing Centre at Gwersyll yr Urdd Llangrannog01239 652140work Rock ClimbingRain or shine this indoor climbing Centre is an ideal place to test your nerves! You can arrange a birthday party at the climbing centre (on Sundays) or arrange to book a group for hour long or two hour sessions, with the price arranging from £7 to £15 depending on the length of the session and size of group. 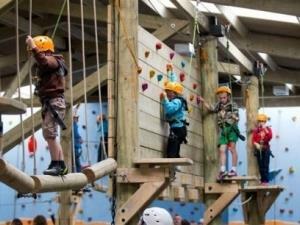 The Ropes Course is very popular at Gwersyll Llangrannog. To complete the course you must work as a team. This is where you will find out who your real friends are ! Rain or shine this indoor climbing Centre is an ideal place to test your nerves! After working as a team on the Ropes Course, you may get a chance to go on the Zip Run. You must be over 16 years old to try this ...and enjoy being 20ft in the air on top of a telegraph pole !! !